Do you guys want to prank your friends or family members by calling to their phone using numbers like 100, 000, etc.? If yes, Continue reading.Today in this Article I will show you guys, How to prank call your friends from numbers like 100,000,589, etc. 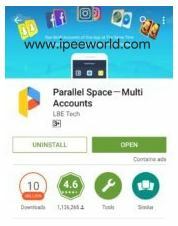 This trick is all based on a simple app which is available on the Google Play Store. So, anyone can use this trick. Again, this app is just less than 5MB so, it won’t cost you any excessive data either. Recently, I received a Call from a number something like 125 and I was really surprised to see who it was.I picked up the call and no one was speaking to me.After some time, I again got the call from a different number, then after some time, y friend told me that he called me from one ID Changer App. Then I did some research and find an App called ID Changer. Which help us to call anyone with any number.No country restrictions are applied, You can call to/from any country to any country.Also, Check Top UC Browser Tips&Tricks that you never know. This trick is working perfectly fine and now read the steps mentioned below carefully to understand, How you can too do the same.I personally tested it with one of my phones and I was quite surprised to see the result.I have also attached a screenshot below for proof. Before going in, make sure that you only call friends you know.This article is only for educational purpose and if anything goes wrong, I’m not responsible for anything.So,do it at your own risk. Step 1: Download and Install ID Changer app from Google Play Store. Step 2: Open the ID Changer App. Now you will see two fields to enter Caller ID and Number which you want to call.In Caller ID field, type the number you want to display to other person and in “To” field type the number who you want to call. The person will receive a call from the number like one below in the screenshot.Now he/she will be surprised to see who is calling from a number like this! ID Changer App is not completely free. As the default, when you install the app it will have some balance and after some time it will be exhausted.In that situation, you should buy points from them in order to continue using it. Step 2: ow open the App and click on the clone button. Step 3: Now a list of installed Apps in your phone will be displayed.Click on the ID Changer App from the list. Step 4: Now open ID Changer from Parallel Space and start using it. Now you will get trial points again. That’s it, Now you can call to any number from any number for free for unlimited times.You are not required to pay a single penny for this.